I don’t know how many times a week I get asked my opinion about what constitutes the best zero for a hunting rifle. Of course there are several things that effect this and one is anticipated range. Obviously the caller has something in mind because there is a stated range. Maybe it is lack of practice yardage, lack of time or lack of knowledge but we can fix this. We know that the vast majority of deer are harvested at less than 100 yards, usually substantially less. But that buck of a lifetime may present itself on the far side of the field and that is about 300 yards so we need to take that into consideration also. So what are we to do? Here is my advice formed from several notable mistakes made by friends and me personally in the field. First Scenario – I’m going to a western state and anticipate long shots so I zeroed for 300 yards. I practiced diligently and felt suitably proficient in my ability to take a 300 yard shot. So I get to my destination and head off into the game fields. I’m sneaking around in stealth mode and right there in front of me is the buck I came for no more than 75 yards away. An easy shot in any state except the state I was in. The heart area was obscured by sage brush and I had only a high shoulder shot available. Piece of cake at this distance. I had a decent rest available that I used and carefully took aim being sure to slide my shot just over the top of the sage for a spine shot. I took the shot and the deer disappeared unscathed! I missed? Yup, shot right over his back, never touched a hair. How could that have happened? Easy! I was at least 3 inches high at that distance and I didn’t account for it in the amount of time I had to make the shot. Had I had access to the vital heart or even lung area the shot would have been successful albeit not where I thought it should have gone. The good part is I never touched the majestic buck. The moral to this story is I changed my zero that afternoon to an inch high at 100 yards and collected a very nice buck the next day. The distance? About 80 yards. Scenario two – We are zeroed very carefully at 200 yard here in Missouri. It is a solid zero as evidenced by multiple targets fired at various distance at longer and shorter distances. Our altitude is just under 1000 feet about sea level at the range we were shooting. We get to where we are going to hunt and all we have presented are long shoots on open prairie. Uh oh, no way to get closer and the range finder is reading 327 yards. What to do? We have a 200 yard zero, no problem just hold mid-body right behind the shoulder and let ‘er rip. Boom, I see the bullet hit mid-body right next to the shoulder. Three steps and down right there. Although a successful shot I asked where did you hold, right where you told me mid-body, was the answer. No way, this isn’t a fire breathing magnum and the range read was good why was this little gun so flat? Then it dawned on me, we’re at 8000 feet and the trajectory is flatter at 8000 than it is at 1000 for sure. 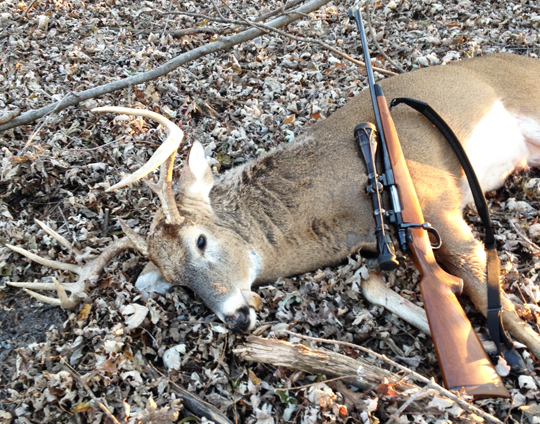 Mike Machholz’ 270 w/130 grain SBT GameKings® zeroed at 200 yards accounted for this nice white tail at 125 yards in 2014. Scenario three – I’ve got my brush gun and it carries a tried and true 100 yard zero. I can hit a gnat at 100 paces, no problem. So here I am enjoying a nice sunshiny day on the north side of a cut bean field on a very beautiful November day. Being careful to stay among the trees but not really sneaking along. I catch movement about 250 yards away on the other side of the field. I lean against a tree and get a steady look with my binoculars. It is a very nice white tail buck, head down obviously following a hot scent. All I can do is watch. I’d have to hold over his back to even consider this shot and there is no way I could be certain I could make a successful shot at that distance with that rifle zeroed that way. I carefully ducked into the trees and headed in the direction the buck was traveling. I had the wind but he had the light. Knowing that I hustled to the end of the field to intercept him in his amorous blindness where I could cut the range to a very doable 75 yards. Apparently the buck knew that to and failed to show. The answer to all three of these scenarios is simple, a 200 yard zero. Almost any unbelted hunting cartridge that produces at least 2600 fps with your chosen hunting load will benefit from this. Basically you will be about an inch high at 50 yards and 2 inches high at 100 yards and 8 inches low at 300 yards. This entry was posted in Hunting Stories and tagged deer hunting, gun zero, hunting, hunting gun, hunting rifle, hunting zero, zeroing a hunting rifle. Bookmark the permalink. Maybe you mentioned it and I missed it, but different elevations from shooter to target come into play, too. It doesn’t matter if you’re shooting uphill or downhill at your target, your gun is going to shoot high. This is admittedly a small factor unless you’re in very hilly or mountainous terrain but it is there, nonetheless. The best practice you can get is to shoot at various ranges with your gun and find out for yourself where the bullet will hit. The best overall advice is…get closer. You need to get close enough that there is no doubt in your mind where the bullet will land when you pull the trigger. If you can’t get that close, don’t shoot. What is the recommended zero for belted cartridge? My Vanguard 30-06 is zeroed at 250 yards with Sierra’s 150 gr SBT. Bullet path is +.77″ @50; +2.5 @100; +2 @ 200 and only -3.7 @ 300…I’ve shot several out past 200 across the field as well as some under 75 in the woods. This set up has yet to disappoint me. I agree. I generally zero at 1 to 2 inches high at 100 with all my center fire rifles. Using scopes (bore axis to scope center distance) it should be just about spot on at 50ish and will be lethal out to almost any Missouri topographic range. There’s nothing wrong with a 200 yard zero except that many rifles can kill big game at much longer ranges. Match the height of trajectory with the range to which game might be spotted, the size of the vital zone, the range to which the bullet will expand and retain sufficient energy. Typically, for northern whitetailed deer with a 10″ vital zone a medium cartridge like .308, 6.5×55, or 7×57 will reach out and touch with a 350 yard zero. Just aim for the 6 o’clock position on the vital zone and you are good from the first zero to much farther than 200 yards. If you can see the browns of their eyes hold dead-centre. With more powerful rifles, if you know your shots will always be long you can reach 400 yards or a bit further. One way to look at this is using the flattest part of the trajectory. Many bullets drop like stones after the second zero. If you can just shoot at stuff before the second zero. For big game it may be possible to zero for a very long range and hold under to use the 200 yard interval around the highest point of the trajectory. Many rifles can stay within 8 inches or so over that distance around the flattest part of the trajectory. Zeroing for 1-200 yards may be very useful but it throws away good chances in open country and doesn’t respect the true capabilities of common rifles, components and reloading techniques. There was a time when one had to spend some money to have any hope of a 1MOA hunting rifle but today 0.5MOA is fairly easy. I’ve seen Rem 788, Win M70, Rem 700 and 783 do that sometimes even with commercial ammunition. 0.5MOA is 2 inches at 400 yards. On a calm day at a standing target with a rest it’s wort taking a shot. It’s very difficult with a 200 yard zero. I would rather zero at 100. This allows a lazer trajectory for shooting through holes in brush. When in the open, I crank up a couple inches as indicated above. This requires good turrets, tested to be accurate. And, of course, remembering to crank back down afterward. I do most of my hunting with a .270 or a .300 Win Mag. (There are others, but these are my two go-to rifles). Both are sighted in at 200 yards. On our Coues deer, that is a dead on hold out to 225, and a top of the back hold at 300. After 300 I get out the range card.